Rarely has the future been so clear. Really?? A lot of money has been lost jumping on the bandwagon. Let�s do a common sense check on the greenback to gauge where risks might be lurking and where there might be profit opportunities for investors. During her confirmation hearings, incoming Fed Chair Janet Yellen testified that U.S. monetary policy is to revert towards more traditional monetary policy once the economy is back to normal. With due respect, in our assessment, that’s an oxymoron. In a “normal” economy capital is allocated according to the risk profile of the project under consideration. However, when the Fed actively distorts the price discovery mechanism with its QE programs, we believe it is impossible to move back to a normal economy. The Fed has told the market in no uncertain terms that it is in no rush to raise rates. Outgoing Fed Chair Bernanke often argued one of the biggest policy mistakes during the Great Depression was to raise rates too early. Trouble is, removing stimulus might allow deflationary forces to take over once again, negating the “progress” that’s been made with cheap money. 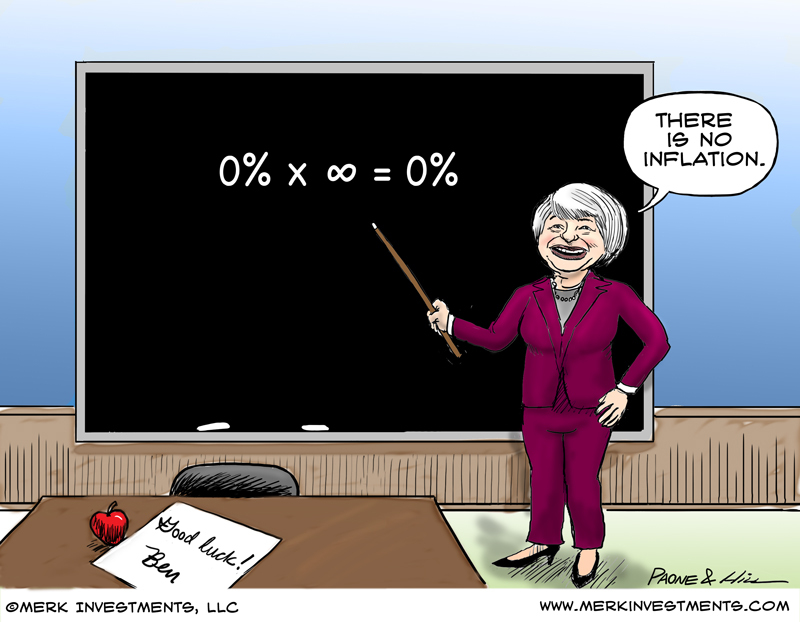 We interpret that to mean the Fed has all but promised to err on the side of inflation. Yellen is said to favor a rules-based approach to setting policy rates. In theory, that’s laudable, except that Yellen in particular appears to prefer “rules” that heavily discount inflation indicators in favor of employment indicators. Hawkish Fed? Do Pigs Fly? Stan Fischer has a mixed record on the “dove-hawk” scale. After the outbreak of the financial crisis, he raised rates in Israel before any major central bank did. But he also peddled back, lowering rates again in due course. That’s not being hawkish, but pragmatic. While Israel has worked hard to play in the big league of central banks, it’s still a small country and policy action there might shed little light on what Fischer will do at the Fed. More relevant to U.S. policy is that Fischer is no friend of “transparency” at any cost, having criticized the Fed for tying Fed policy to the calendar. His former student Bernanke got the message, denying on every occasion now that the course of tapering is pre-set. In our assessment, the real reason Janet Yellen wants Fischer to join her is to have a statesman back her up. 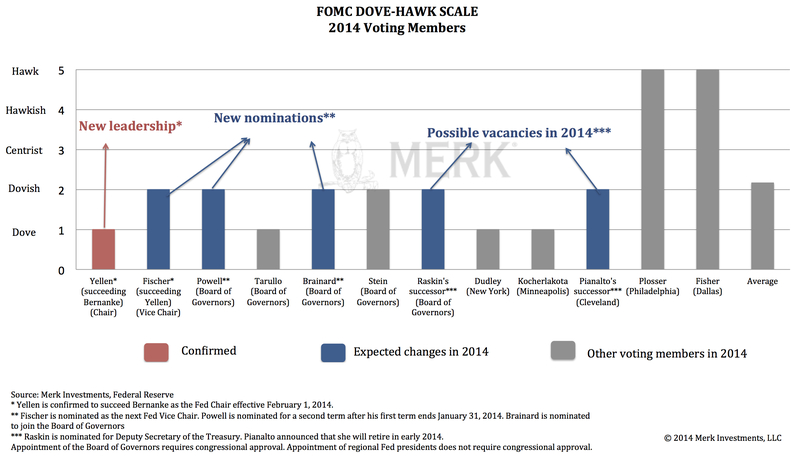 The hawks at the Fed have increasingly been voicing their unease. Without Fischer, their gripes might have gotten a lot of attention. Should it get uncomfortable for Yellen, she counts on Fischer to have her back, taking the punch out of hawkish rhetoric. Should Fischer disagree with Yellen, we believe he’ll work things out with her behind the scenes. 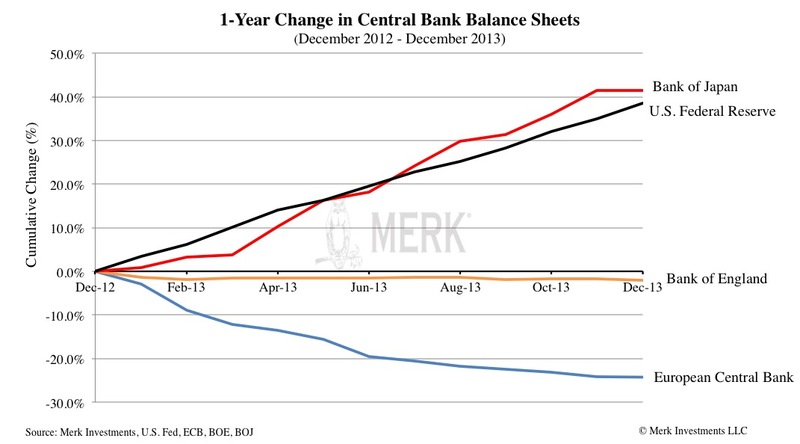 The European Central Bank (ECB) is the only one that has not only been tapering, but mopping up liquidity. It’s not so much that the ECB wants to play the tough guy on the block, but that Eurozone central banking is more demand driven: as banks clean up their balance sheets, they return liquidity received from the central bank. In a page A1 article in the Wall Street Journal at the beginning of the year, we received praise for our controversial call a year ago suggesting the euro might be the rock star of 2013; it turns out the euro was indeed the best performing major currency last year. We believe the euro will continue to benefit from risk friendly capital returning to the Eurozone. Capital that continues to flee weaker emerging market countries (remember those hot emerging market local debt funds?) is flirting with both peripheral Eurozone debt and equity markets. And while the ECB is not happy about the strong euro, we don’t think the central bank can engineer a weaker currency. This does not suggest problems are over in the Eurozone, but this year may prove once more that lackluster growth is not an impediment to a stronger currency. We have been quoted as giving a price target of 1.50 versus the dollar in 2014. On the chart above, the Bank of Japan (BoJ) has been the most prolific money printer over the past year (physical currency is not actually printed, but central bank action to increase the monetary base is colloquially referred to as the printing of money). It may come as no surprise that the yen was the worst performer last year amongst major currencies. The yen has drifted sideways of late as Prime Minister Abe’s policies have lost momentum. Unlike the past, however, we think Abe may aggressively double down, pursuing ever more expansionary fiscal policy. Meanwhile, the BoJ has recently ramped up its rhetoric on doing what is necessary to meet their 2% inflation goal. We don’t think it’s a surprise that Japan won the bid to host the 2020 Olympics, as the infrastructure investments needed are squarely in line with Abenomics. In that context, expect higher military expenditure as well. Our price target for the yen continues to be infinity, meaning we don’t see how the yen can survive this. That’s because the biggest threat facing Japan (the U.S. as well, by the way) is that economic growth actually materializes: good economic data might cause bonds to sell off, making it ever more difficult to finance government deficits; if so, we expect the Bank of Japan at some point to step in to lower the yield on Japanese Government bonds (JGBs); the valve, we expect, will be the currency. While central bank balance sheets for the biggest countries have been indicative of currency moves, there are limits as to what these charts show. 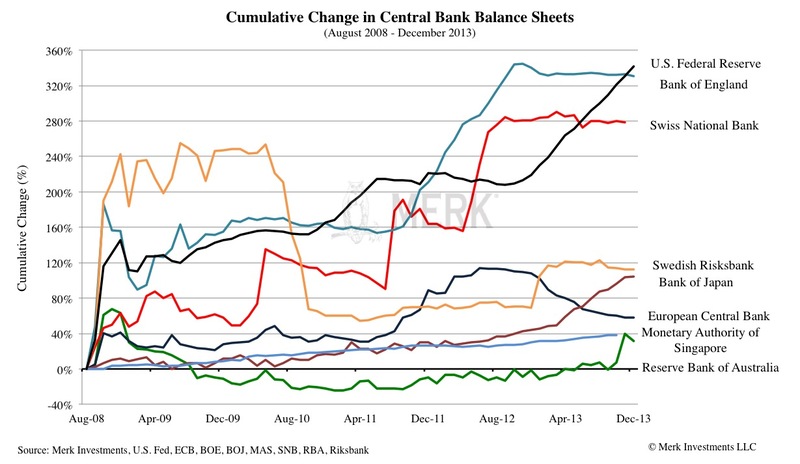 Notably, the Swedish central bank a few months ago, as well as the Reserve Bank of Australia just recently have shown a spike in the size of their balance sheets. These movements have less to do with monetary policy than to changes in regulations and payment systems, in part requiring higher cash reserves. While on the topic of Australia: the formerly beloved commodity currency took a beating last year. While pessimism reigned in Australia, New Zealand was on a tear. In fact, the Reserve Bank of New Zealand is expected to raise rates a couple of times this year. Historically, both of these currencies are highly correlated to one another. Based on fundamentals, the New Zealand dollar should do great and continue to beat the Australian dollar. However, New Zealand isn’t exactly the biggest country and its currency can be notoriously volatile. So while things look good, that provides no assurance the currency will actually do well. At some point, good economic indicators coming out of China may well push up the Australian dollar and cause substantial profit-taking in the New Zealand dollar. Throughout 2013, we became increasingly cautious about Norway. From a dovish central bank concerned about a strong currency to an increasingly populist government, we became rather disillusioned with the prospects. That, in turn, left the Swedish krona as the Nordic currency of choice. Sweden is likely to cut rates once more this year, although that action is mostly priced in. Being a smaller country, policy shifts tend to be more dynamic. Oh Loonie! Once dovish Mark Carney left the Bank of Canada, we – like many in the markets – thought his hawkish deputy Tiff Macklem would succeed him. Not only did he not succeed him, he is calling it quits. Aside from losing hawkish intellectual leadership, the Bank of Canada has had, to put it mildly, fostered a benign neglect of its currency. The key risk we see with our cautious outlook for the Loonie is that we are not alone in that view. Emerging markets tend to be less liquid than developed markets. Last spring showed this matters: when volatility spikes because of uncertainty over the future course at the Fed, the previously perceived free lunch in capturing yield with low volatility in emerging market local debt markets causes stomach cramps. Not only will we likely have local disturbances with numerous elections coming up in emerging markets, but we think the heavy hand of policy makers in major economies may well persist. Most vulnerable in this context are the weaker EM countries – those with current account deficits. The notably exception here is India, where Reserve Bank Governor Raghuram Rajan has introduced major reforms since taking the helm last September. While Indian reforms always suffer from implementation risk, the Indian rupee has a lot of catching up to do. Conversely, however, even as Brazil may yet again raise rates, Brazil lacks a credible inflation fighting strategy. China is moving ever closer towards opening up its capital account. This may well be the year where China reduces its U.S. Treasury purchases in a meaningful way and paves the way for market forces to play a greater role in setting exchange rates. For those with doubts about China’s commitment, please read this interview with Yi Gang, Deputy Governor of the People’s Bank of China, as well as administrator of SAFE, China’s foreign exchange regulator. In our assessment, little can stop the rise of the Chinese yuan as a major currency in the coming years. The creation of a major currency takes more than a free float, but China is fostering all the other necessary elements. The biggest risk for 2014 may be economic growth. That’s because economic growth throws a wrench into the bond market, making it ever more difficult for developed countries to finance their deficits. We believe it’s very unlikely the U.S. could afford significantly positive real interest rates for an extended period. As indicated earlier, theFed may have all but promised to be “behind the curve” in raising rates. Even if the Fed wanted to raise rates, the stockpile of excess reserves accumulated from QE means that they will have to rely on new tools that require them to pay increasing amounts of interest directly to financial institutions. The potential political backlash of these new rate-setting tools may make it more difficult to mop up liquidity. Meanwhile, if economic growth and demand for loanable funds comes back, the banking system could pyramid those excess reserves into new loans that could dramatically increase the money supply and stoke inflation. The Fed may need to rely on capital adequacy ratios to contain bank balance sheet expansion, but it should be easy for banks to raise more capital in a good economic environment. It’s in this context that the future may look bright for the shiny metal. Importantly, even with the price decline in 2013, gold played its role as a diversifier. The time to rebalance an equity portfolio is when times are good. We are not suggesting all this rebalancing should necessarily go into gold, but we are not convinced the bond market is the right place either. As our readers may well know, we think that the currency markets may provide opportunities that offer diversification. Please register to join one of our upcoming Webinars. Our next webinar is this Thursday, January 16, 2014. Please also sign up for our newsletter to be informed as we discuss global dynamics and their impact on gold and currencies.